From left, Westchester County Local President John Staino, Westchester County Unit President Karen Pecora, Westchester County Executive- elect George Latimer and Southern Region President Billy Riccaldo. WHITE PLAINS — When labor is under attack, CSEA members stand up and fight back. That is especially true this year. Not only did CSEA efforts help defeat a state constitutional convention, our members in Westchester County were tireless in doing the phone banking, labor walks and campaign work that resulted in voters overwhelmingly choosing state Sen. George Latimer to replace two-term incumbent Rob Astorino as county executive. The defeat ends eight years of Astorino routinely bashing CSEA’s insistence on a fair contract, underfunding vital services, and even going so far as to single out CSEA Westchester County Unit President Karen Pecora during layoffs. Latimer, a friend of labor while serving in various elected positions, has pledged a cooperative working relationship with CSEA, in sharp contrast to Astorino’s adversarial approach. CSEA members in Westchester County Unit are seven years without a contract due to protracted negotiations with Astorino’s team. Members overwhelmingly rejected a memorandum of agreement last year, stating that the deal would have ultimately meant a pay cut for some of the lowest paid members once health insurance contributions were factored in. In a chilling move, Astorino targeted Pecora’s county position for elimination during a wave of layoffs in late 2012. An arbitrator ultimately returned Pecora to her former position with back pay, agreeing with CSEA’s charge that the layoff was clear anti-union animus and a violation of the Taylor Law. Astorino has also stalled negotiations for the Westchester Community College Unit by refusing to refer a memorandum of agreement, ratified by members and the college Board of Trustees, to county legislators for a vote. Fed up with Astorino’s treatment, CSEA activists spent months making phone calls to other members, knocking on doors and dedicating their time on Election Day to get Latimer elected. CSEA/VOICE Chapter Representative Cynthia Bolding reads a statement from a parent from her program who cannot afford the steep parent copays that Astorino repeatedly raised during his tenure. She is joined by Southern Region President Billy Riccaldo who came to offer support. 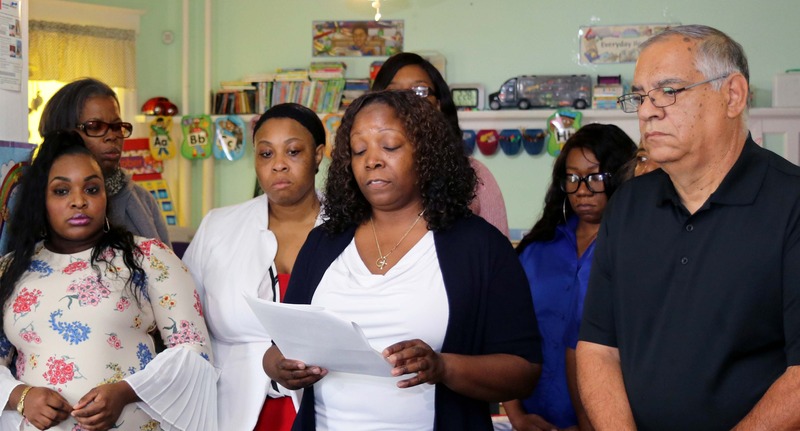 CSEA/VOICE Local 100A Family Child Care Providers from across Westchester County, fed up with the Astorino administration’s failed child care policies and inability to fix the flawed subsidy payment system, jumped into action to join in the effort to elect George Latimer. The last straw came recently when contracted providers received bills for a county miscalculation costing as much as $40,000 each. Previous years of underpayment with no reimbursement moved CSEA/VOICE Local 100A’s Westchester-Putnam chapter into action to decry hypocrisy and say enough is enough. 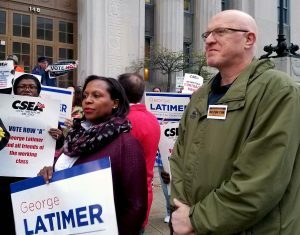 The providers joined the Latimer campaign and CSEA Southern Region leaders in holding a press conference urging providers, parents and all working families to vote for change by electing Latimer. Providers also distributed literature to other providers, their families and parents of the children urging them to support Latimer, who supports child care. On Election Day, CSEA/VOICE providers in Westchester had conversations with parents about Latimer at pickup and offered to watch the children longer for parents who needed time to vote. Westchester County Unit 1st Vice President Hattie Adams, left, and Westchester County Local President John Staino were part of a group of CSEA activists jamming the sidewalks during a rally outside the county’s Michaelian Office Building in White Plains. Local media reported very strong voter turnout across the county, particularly in the cities of Mount Vernon and Yonkers. In their efforts to get out the vote for Latimer, CSEA/VOICE Local 100A Westchester-Putnam Chapter Representative Cynthia Bolding and DSS committee member Dinitia Blount focused on turnout from both cities. Thank you to all CSEA members and families for defeating the huge risk to so many good laws and benefits all New Yorkers enjoy by defeating the Constitutional Convention – that indeed was a threat to middle class families. Also, thanks to to all CSEA members and other union members who worked tirelessly to elect George Latimer – a Good Friend of working people and union members – as our 2018 Westchester County Executive! And thanks to Jessica and Jill for this wonderful story about our efforts for the 2017 election.